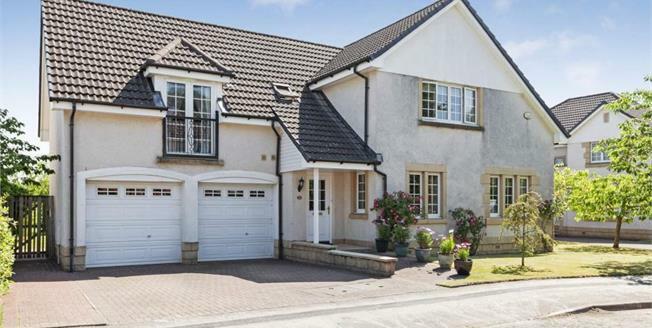 Built approximately 15 years ago by Cala Homes this modern detached villa enjoys arguably one of the best settings within the semi-rural village of Chryston. Retaining a high degree of privacy and seclusion within this cul-de-sac setting, the house is set within the most magnificent manicured landscaped garden grounds and the house itself delivers stylish, well balanced and immaculately presented accommodation over a two storey layout. The ground floor accommodation offers an impressive traditional style reception hallway with staircase to upper level, storage and generously sized WC, spacious formal lounge overlooking the front garden and formal dining room which is also front facing, both rooms feature double aspect window formation. The family room is open plan to the kitchen diner and is a focal point of the property, overlooking the landscaped rear garden and featuring a wood burning stove and french doors flooding the room with natural light. The utility room which has access to the double garage completes the accommodation on the lower level. The larger style upper landing with sola tube/sun pipe, leads to a magnificent master bedroom with front facing aspects, Parisian balcony , two large built-in wardrobes and large en-suite bathroom. A second double bedroom, again with a very large built-in wardrobe, has an en-suite shower room. There are two further double bedrooms, bedroom three has a built in wardorbe and bedroom four has a closet. The main family bathroom completes the upper floor accommodation. The photography can only showcase so much of this beautifully presented home, therefore we urge any interested parties to arrange a viewing by appointment. Additional specification includes gas central heating system, double glazed windows and double integral garage and stunning landscaped rear gardens enjoying total privacy, with views towards the Campsies and over surrounding countryside. There is a lovely patio area , ideal for alfresco dining or relaxation. Located on the periphery of the village in what can be described as a semi-rural environment, Grayston Manor is still within easy reach of the local amenities including schooling. Glasgow City Centre is just some ten miles away by road via the M80 and M8, so it is also an ideal situation for commuting. For those of a sporting nature, Crow Wood Golf Club is less than two miles away.